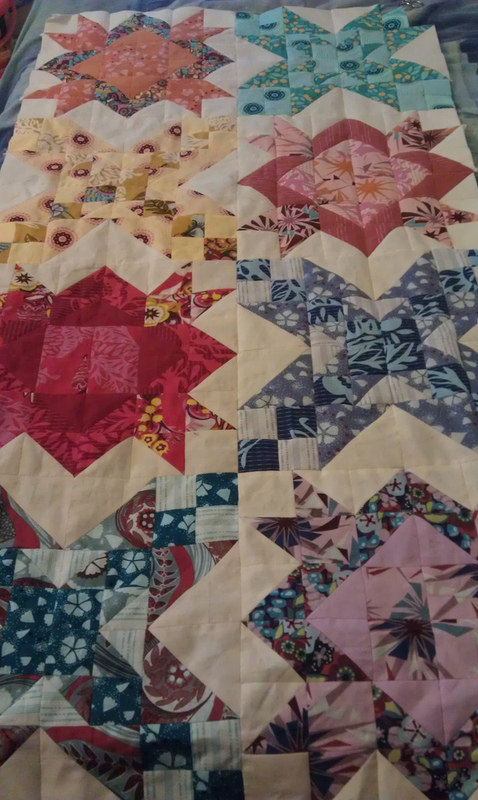 I have reached the half way point in piecing my Anna Marie Horner quilt. Somewhere in amongst the Innocent Crush is a little Field Study. Less than 3 weeks to go to this year’s Fat Quarterly Retreat… Yikes! I have always wanted to try doing the last two, but have shied away from doing it on my own. For the quiet times between classes, I hope to be working on a current project that has just reached the half-way stage in the piecing. Yikes! I am 6 days late celebrating my 2nd Blogaversary, which was 29th April! Better late than never, I suppose, since I have been busy. 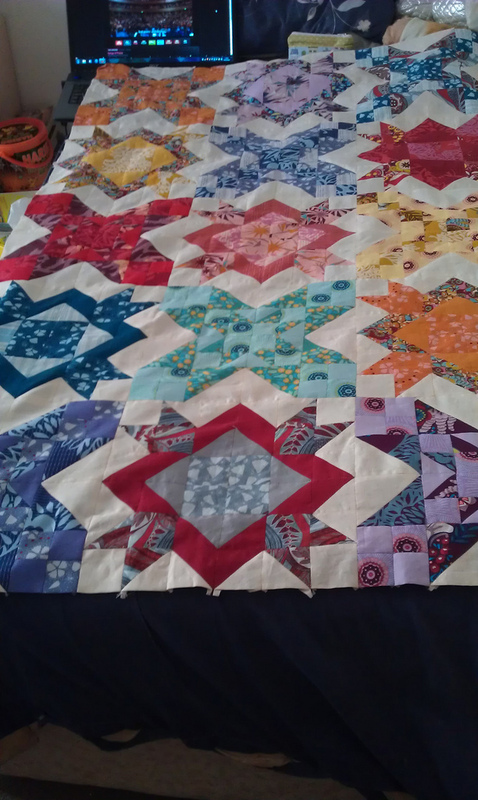 My AMH Innocent Crush quilt is coming along nicely. Nearly 3 rows completed. There might be a giveaway coming soon to celebrate my 2 years of blogging… watch this space. Yes! There is a new kid Guild on the block… Right here in the East Midlands. Today (16th March) was the inaugural meeting of the EMMQG, which was organised by Moira. In all 10 of us met at The Poppy and Pint in West Bridgford: Di, Trudi, Angela, me, Wendy, Moira, Kerry, Renee, Mandy and Liz. This meeting was to decide when, where, how & what. Moira was uber prepared and had come with copies of the agenda, and we spent about 2 1/2 hrs chatting about we wanted out of the Guild and had a bit of a show-and-tell from Trudi, Mandy (with her Weekender Bag!) and Kerry (with her Fryed Pixels quilt!). Our next meeting is on April 20th which will be a Weekender Bag workshop. Venue to be confirmed… watch this space (or my twitter feed) for further info. 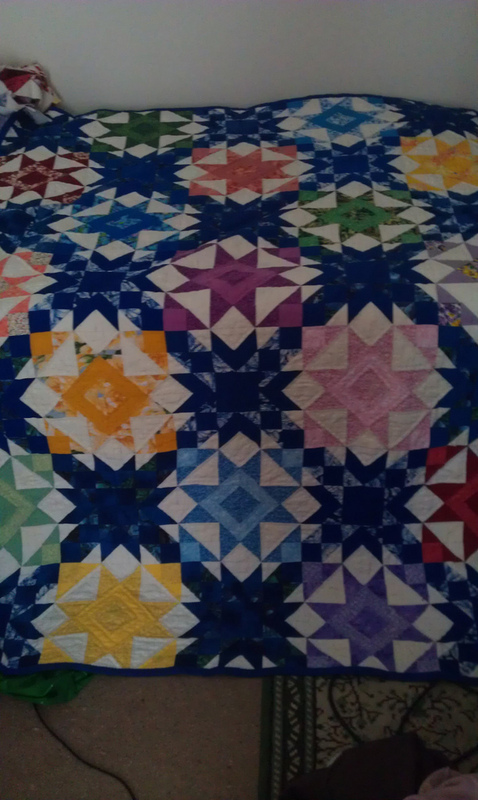 Maybe I will sit in the corner working on my Parson Gray Curious Nature hexies quilt, which is inspired by this quilt by Elizabeth Hartson; my quilt is destined to go to a work colleague who had a baby 4 weeks ago. The last few weeks I have been quiet… Working on a new WIP. You will have seen a picture of the beginnings of my new EPP project on an old post. So I have decided to do an update on Oh My Stars! The Innocent Crush doesn’t have a lot in terms of aqua colours, so I decided to mix in some of Anna Marie’s Field Study. In stash news, I did a bit of shopping during February, both online and in a ‘bricks & mortar’ shop (The Fabric Guild in Leicester). 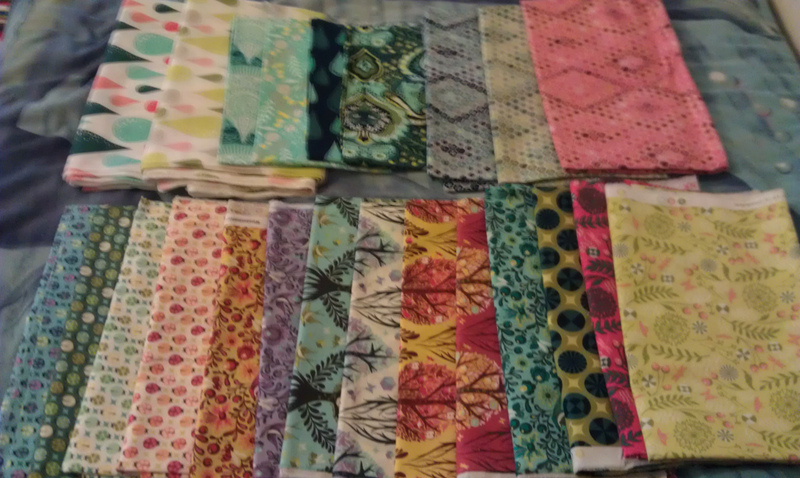 In particular I added to my growing pile of Tula Pink fabrics. Online I got more of the Prince Charming rain drop and Taffy prints, along with a selection of The Birds and The Bees. Might order more of Saltwater to add. 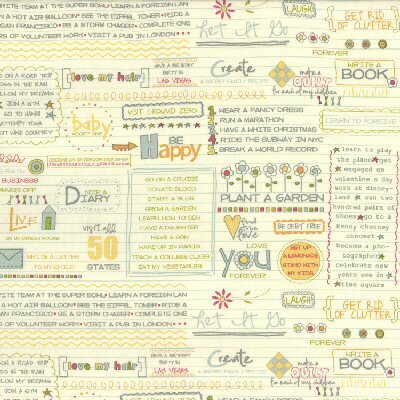 I can see a project starting in the run-up to FQ Retreat 2013 with these fabrics… Watch this space. I had not heard of Siblings Together until Lynne posted about Siblings Togther back in March 2012. Having been lucky to have both parents still alive (or just about, as my dad has on-going heart problems and now has a pacemaker! ), me & my younger brother never went into foster care. I know that my parents had planned for all eventualities, and if they had died when me & my little brother were younger, my mum’s brother & his wife would have taken us in. As I said this didn’t happen to us. However, it happens to children elsewhere in the UK, for many reasons. It can be hard on siblings, as more often than not they are placed in separate foster homes, and the children lose the only family connection they have left. Last year about 70 to 80 quilts were donated to Siblings Together by people here in the UK and overseas. The idea is that each child that goes on a ST camp is given a quilt which would remind them of happy times spent with their brother/sister, and have something they can call their own. Last year I didn’t participate in the charity drive Lynne organised, but this year, due to having run out of space for my stash & having fabric I had brought but not used, I decided to donate 2 fat quarter bundles — mixed bag of chartuese, aqua & teal fabrics with co-ordinating solids, and Moroccan Mirage by Khristian A Howell for Anthology Fabrics. 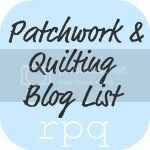 As soon as I posted the pics of the fq bundles in the flickr group pool, they were taken! 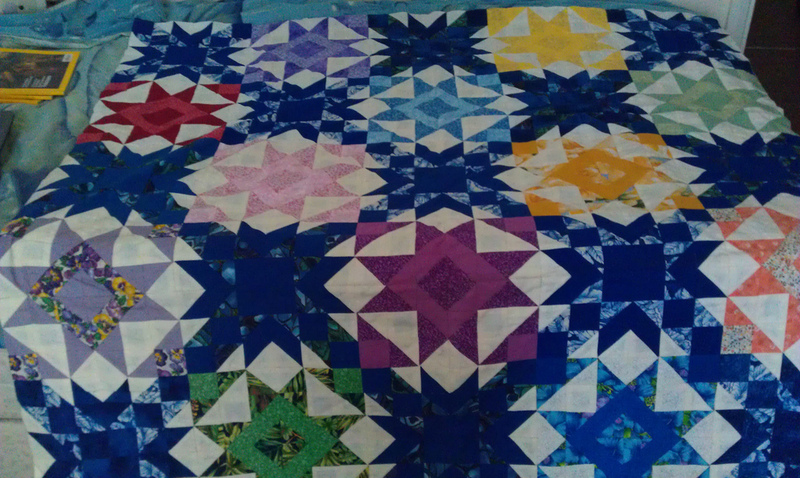 There are other ways you can help — may be you have the time to make a quilt top or the time to quilt a quilt, or can donate fabric/blocks/backings for a quilt.